If you can't get away on that Mexican vacation just yet, here's the next best thing – our festive Mexican Travelocity Gnome! The "Roaming Gnome" has become a legend, and here he's seen on a South of the Border holiday. He wears a classic big sombrero and holds colorful maracas. At 9.5 inches high, this cast resin character will bring along the party to your patio, yard or balcony. Everyone who sees him will say "olé"! 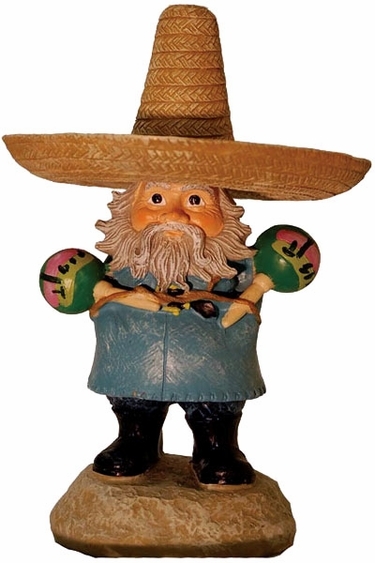 Our Mexican Travelocity gnome is part of our collection of original Travelocity Gnomes and other memorabilia including gnome garden stakes and talking Travelocity gnomes. Travelocity Roaming Gnome w/Sombrero: 6.5" x 9.5" tall. Cast resin.